Front view showing the two levels, interlocking room sections and the chimney for the open fireplace in the restaurant. The restaurant is directly beneath the chimney on the lower floor. The room in the upper left can be privately hired. The kitchen for the restaurant. Curves in the roof and walls create a more natural form for the exterior surface, echoing the lean of the tree. The back of the house from the tree walkway. The two structural towers are more clear from this angle. 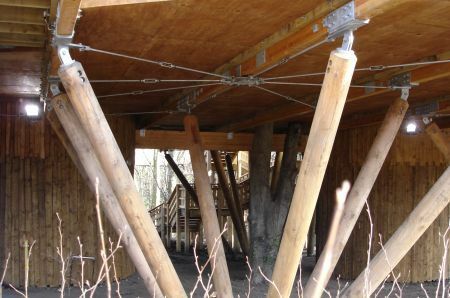 They are constructed using traditional masonry from a concrete foundation under the treehouse and carry much of the weight of the upper floors and restaurant ceiling. The foreground tower carries a spiral staircase that leads up to the toilets and down to an emergency exit beneath the house. One of the smaller houses attached to the main deck, used for storage or for private hire. 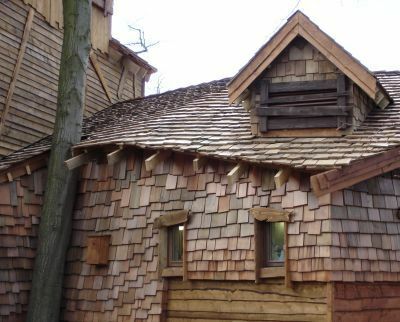 The semi-shingled sides and boarded up windows soften the geometric structure underneath. 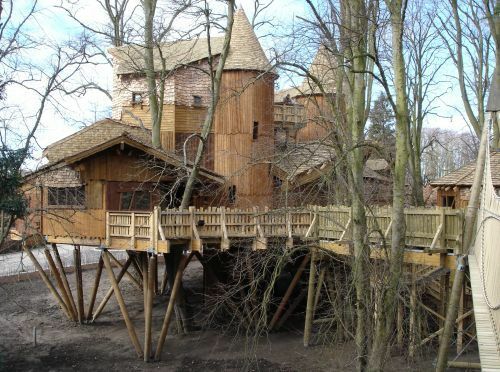 Despite its size, this technique allows the treehouse to blend very well with the trees and landscape of this part of the garden. The massive floor area is supported by the two towers in the background and many of these knee braces. They are positioned mostly in groups of eight with a metal web restraint. 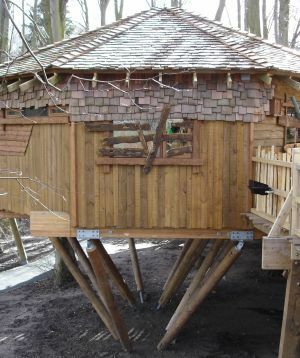 All the structural joints on the treehouse are made in custom-fabricated galvanised steel. This provides the high strength and reliability needed for a huge structure like this but they are expensive. 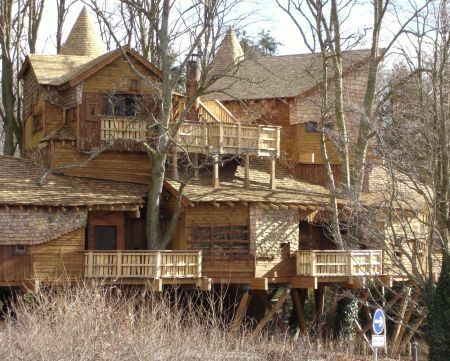 This level of bracket use would usually not be an economical option for someone building their own treehouse. The braces meet at ground level where they terminate via brackets in a concrete foundation.